A lot has happened since 65 people (myself included) were arrested in front of the White House on August 20th during a protest of the planned 1,400-mile pipeline carrying tar sands oil from Canada to the Texas Gulf Coast. For starters, over a thousand more people from across the country were arrested in the subsequent two weeks, including big names like NASA climate scientist James Hansen, author Naomi Klein and actress Daryl Hannah. Support from high places soon followed, from the New York Times editorial page to nine Nobel Peace Laureates. Momentum kept rolling throughout September with protests popping up at Obama campaign events and an impressive day of civil disobedience where over 200 people were arrested on Parliament Hill in Ottawa. As attention continued to swirl around an issue that had only weeks prior been known by environmentalists and people living along the proposed pipeline route, cracks within government began to emerge. By early October emails surfaced detailing a scandalous relationship between State Department employees and a former Hillary Clinton presidential campaign leader turned pipeline lobbyist. The New York Times called this discovery a “flouting of environmental law.” Not long thereafter, 20 members of Congress and three high-ranking senators expressed “serious concerns” about the pipeline and the State Department’s tainted approval process. Only a day ago the President’s press secretary said the State Department would make the call. Now, it’s very good to see the President taking full ownership of this decision and indicating that the environment will be the top priority going forward. Of course, it’s not just people in Nebraska that are upset about this project. People from all 50 states were arrested in Washington this August protesting the pipeline and they will be coming back to the White House this Sunday because this pipeline is also a conduit for climate change. According to Reuters, President Obama’s advisers are already worried that approval of the pipeline could cost him political support from Democrats in 2012. Senior officials at the White House and Obama’s Chicago campaign headquarters have fielded complaints from supporters who are unhappy about TransCanada Corp’s plan to build a massive pipeline to transport crude from Alberta to Texas, sources familiar with the situation said. The concerns could contribute to a delay in the approval process for the Keystone XL pipeline just as the 2012 presidential campaign heats up. We will meet at the center fountain of Lafayette Square Park. The rally begins at 2 PM, with a little bit of live music starting at 1:30. 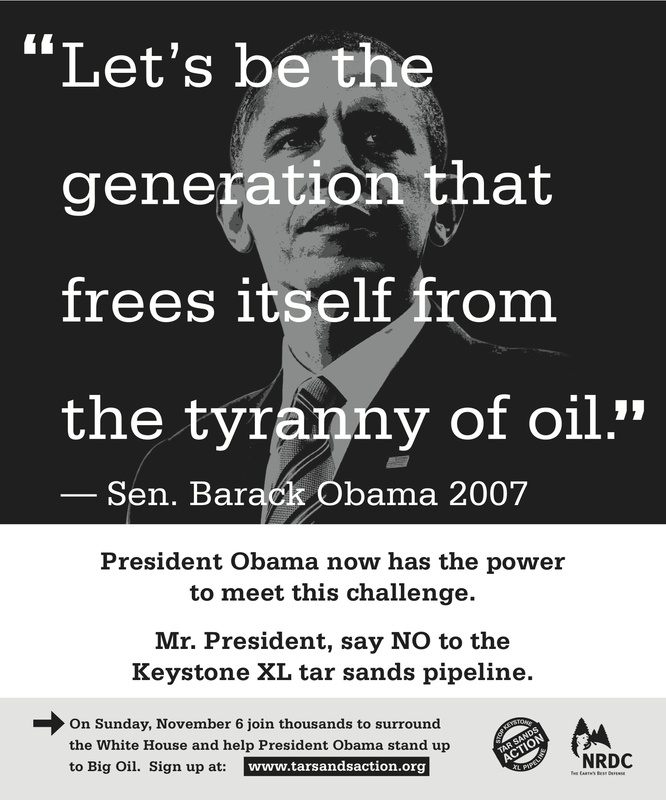 The rally will be MC’d by Bill McKibben, featuring speakers from across the movement to stop the pipeline. After the rally, we’ll receive direction on how to get in to position around the White House. We have a team of over 100 monitors and marshals ready to make sure everything goes smoothly. After we surround the White House, we’ll head back to the park, and hopefully wrap up just as the sun sets at 5:30. Excellent piece Bryan Farrell. All the best this weekend. I know you’ll get a lot of support from the folks at Occupy DC and Occupy Freedom Plaza.